This race is a point to point affair along the beautiful kal haven bike trail (Kalamazoo to South Haven) and since I didn’t want to wait for a return-to-start bus ride, my lovely wife accompanied me which is always nice. We left our house about 5:20 am and got to the race start about 70 min before the gun. Misty rested while I checked in and chit-chatted with a few runners. I finally got to meet a running facebook friend, Melissa, and also saw Katherine, her bf, and my other running friend, Brian. Misty woke up in time to meet them and say good luck and I wandered over to the starting line. Brian and I decided to start out together and took off in a gentle 7:40ish pace. We ran together for the first 7-8 miles together talking about all sorts of stuff. I have run with him around Jackson before and he is a really nice guy. We differ greatly on politics and religion, so we decided to avoid those subjects today, wanting to enjoy the run. He has been struggling with some health issues the last 16 months or so and has tried all sorts of stuff including a 14-day water fast. I have read about the positive health benefits of such a fast and I think about doing one every once in awhile. Maybe after racing season, who knows. There were reasonable sized aid stations every 2-3 miles during the course but the weather was so perfect, I was fine with mostly water during the race. I got terribly dehydrated just a week before, so I was paying much closer attention this time. Race temp was in the high 50’s all day, which was awesome. It technically was an ultra, so they had two aid stations for drop bags, at mile 13 and mile 27. The second one was sortof close to the finish and I didn’t quite understand that. I made throw-away drop bags with coke, chips and cookies for each of them. When I got to the mile 13 aid station, the drop bags had literally just been driven there so I had to root around in the box for my bag. I ended up just grabbing the coke as that was all I wanted. It is only a 33.5 miler, so I didn’t need spare shoes, or real food. My bags were more ‘just in case’. At about mile 8, a group of fast people from the Grand Rapids area came up from behind us and I was feeling good, so I went out with them, picking up my speed, doing 7:15-7:20/min miles up until about mile 20. At about mile 20, the tiredness in my legs from the previous week started to pop back up. Knowing that I had a 100 mile in 2 weeks and not wanting to ruin that by over-doing it this day, I dialed back just a bit. with my overall average pace for the race going a little above 7:35, which is still faster than what I did the first 8 miles in. With less than a mile or so to go, my friend Brian who I left behind 2 hours before actually caught back up with me and passed me along with another runner. He was flying and when i talked to him later, he told me that mid way through he just got a boost, and it felt good, so he dropped the hammer. I wish that happened to me when -I- raced, but sadly, it never does. This race was the Road Runner Club of America Michigan UItra Championship so there were some speedy guys in the race which is why my placing was not that awesome. I however was very pleased with my time, being 2.5 miles longer and 30 minutes faster than my 50K the previous week. I rolled into finish and my legs tightened up pretty quick so I drank lots of water and walked around for a while which really helped. My mother in law, living very close to the finish, decided to come out with Misty as well to see me cross the finish line. We decided to go out to lunch and my stomach was not very happy. My post race meal was actually some french onion soup and a nice cold beer. As long as I ate it slowly, it was ok. I recovered much faster from this race than the previous week when I ran a lot slower. This is not a huge surprise because if you run slower than usual, you use different muscles than normal and hence are sore for a while afterwards. Last week I had little choice due to the nature of the trail, but this week I got to get more into my normal stride. What I need to do is more trail runs in training. That would help. 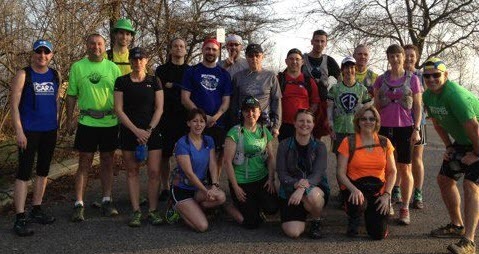 My spring racing season which includes 3 races in 4 weeks with a total distance of 164 mile all started with a local RUT 50K on the famed podowanami trail (known to locals as the ‘poto’) in nearby Pinckney Recreational Area. 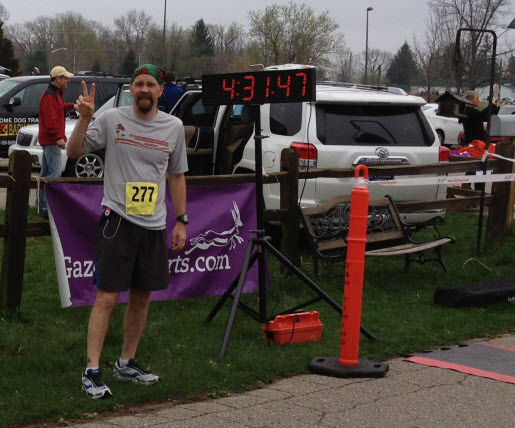 This was my 6th FA marathon(+) in southern Michigan and they are starting to grow on me. No shirt, no medal, but you get good times, and meet new friends, and all for the lowball price of FREE! Yeah, it was that beautiful. The temperature was mid 50’s and would get to low 70’s before it was over. This was the first run of any ‘warmth’ since last September, and that would hurt me. The 50K route was one run of the 17 mile loop, one run of the 14 mile loop which are almost identical except for one 3 mile ‘extra’ portion. The trail is a tough one. There are roots and stumps all over the place and the trail is up and down most of the way. No serious hills, just a zillion small ones. It was virtually impossible to run an even pace, no matter how fast you were trying to go. I will be right back here in 6 weeks doing yet another 50K so this was good training for that race. My opening pace was pleasant, and I really enjoyed the scenery the few times I had enough guts to look up from the trail, which is dangerous on this course. About 10-11 miles into the 17 mile loop, I came to an intersection and I was not quite sure which way to go. Just then, my new friend Pete caught up with me. We thought about it, made our choice and moved out. In the end, I think it was a wrong turn, but we added miles (we think) that were undone by another wrong turn later. 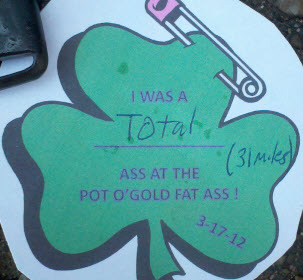 In the end, I ran just over 31 miles. I have the GPS watch data to prove it We stayed together and talked about his life (grew up in UK, moved here in January, post-doc in Natural Resources) and standard running banter. He is a cool guy and even wore a bright green St. Patrick’s Day hat on the first loop. We got back to the start/finish line in 2:20 (A little over 16 miles was our distance at that point) and loaded up our bottles, and were back on the trail in about 90 seconds. I decided to -only- use my handheld water bottle that holds 16 oz this day and that was just dumb. I drank 16 oz of Gatorade during the first loop, and downed 2 juice boxes during that 90 second stop and re-filled my handheld. It would not be enough, not even close. On the second loop, we continued our conversation, getting into educational philosophy (a favorite running topic of mine) and other topics. About 4 miles into the 14 mile loop, Pete started to drop back a bit, and indicated that the heat was starting to get to him (me too, just not as much. Yet) and I left him back and I headed out picking my pace up again. It took me about a mile to realize the miles were going by a lot faster talking with Pete. Oh well, turn on the techno and get back in the game. After about 20 miles, my dehydration problem was rearing its ugly head. I still had liquid in my bottle, but I also had 10 miles to go, so I had to make it last. The temperature was rising, no wind, and no real shade. 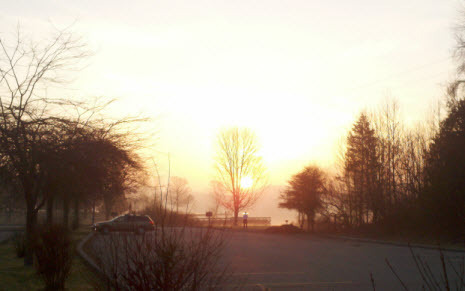 There are plenty of trees, but none had leaves, so I saw the sun all day, but I was rarely in ‘full force’ sunlight. By mile 24 I was walking up hills and just trying to get through the last miles, and they were slow. I kept looking back to see if Pete was going to catch me, he never did. I got back to the car in 4:50, and when I stopped, I realized how dehydrated I really was. When I went to sit and drink some water (I drank 2 quarts almost immediately, 2 more in the next hour) I sortof fell. I tried to recover so I could get home (the race went longer than I wanted) as I promised to be home to my wife and children as soon as I could, so I wrote down my time on the official results board and got in my car and took off. It took me about 5 minutes to realize that my brain was not prepared to drive. My electrolytes had not gotten back to where they were supposed to be and I could tell. I ended up pulling over twice on the 1 hour drive home to get ‘stable’. It just took time for liquids to go back to doing their liquid thing. It was slightly scary for a little while. By the time I got home, the gallon of liquid had run its course and I felt 137 times better, my legs were in good condition and my brain got back on line. Ah, yet another good learning experience.